Kaitlyn McCollum teaches at Columbia Central High School in Tennessee. After being told her TEACH grant paperwork was late, her grants were converted to loans. "I'm on the phone in between classes ... trying to get all of this information together, crying, trying to plead my case," she says. 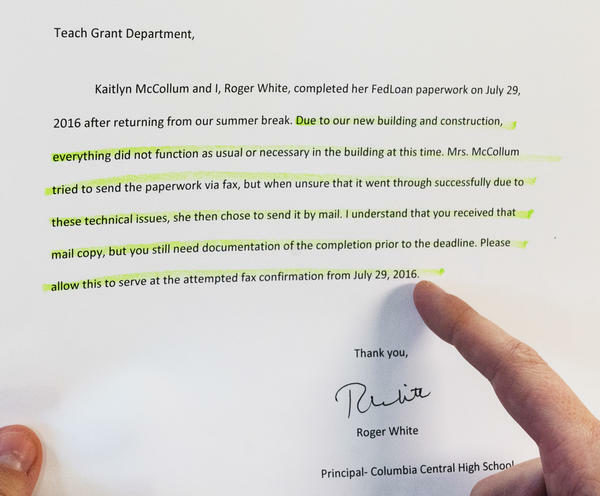 Kaitlin Huckaby McCollum points to documents that indicate a huge mishap concerning a $5k federal grant that unexpectedly, converted her TEACH grant into a loan. It began accruing interest immediately. FedLoan denied McCollum's appeal to get her loans converted back to grants. Many teachers tell NPR they were told they had no recourse even though they have been meeting the teaching requirements of the TEACH grant program. Money was already tight for McCollum and her husband when they learned her grants were being converted to loans. They had just found out she was pregnant with their first child. NPR revealed these problems in a series of recent stories. The Department of Education now tells NPR that it has launched a new "top-to-bottom" internal review of all aspects of the Teacher Education Assistance for College and Higher Education grant program. Officials say that the review is aimed at fixing the issues and that the department is "absolutely committed to improving" the program. 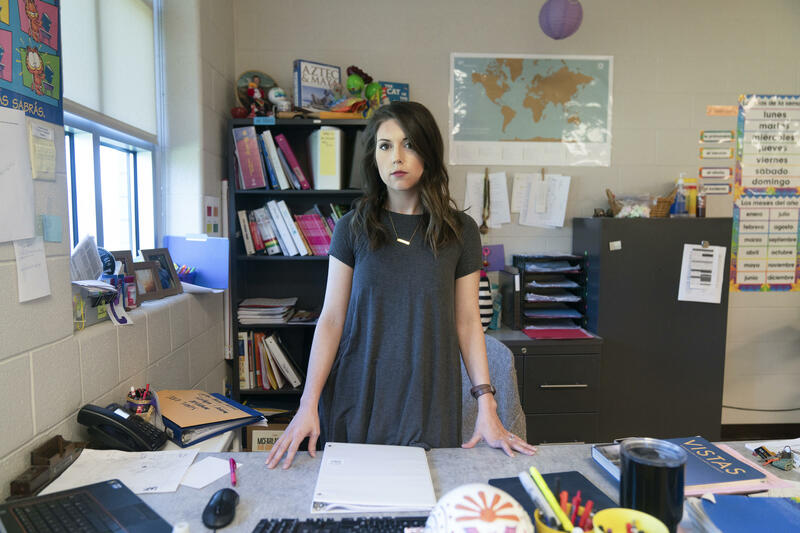 "It's ridiculous; it's mind-boggling," says Kaitlyn McCollum, a high school teacher in Columbia, Tenn., who is among the potentially thousands of teachers who met the teaching requirements for these grants but nevertheless were saddled with debt for money they never borrowed. "It's been two years of torture." This is how the grant program works: It gives teachers money, often called TEACH grants, to pay for an undergraduate or a master's degree. In exchange, they agree to teach a high-need subject, such as math, for four years in a school that serves lots of low-income families. It sounds simple enough. The teachers need to send in paperwork every year, certifying that they're keeping those promises. But too often, a little mistake — such as a missing signature or sending in documents even a couple of days late — can lead to their grants getting converted to loans with interest. So, what was free money suddenly becomes a major debt and financial burden. After NPR aired stories about the problem, emails and social media messages poured in from dozens of teachers saying this had also happened to them. McCollum received $16,000 in TEACH grants. And every year, she says, she sent in the paperwork on time documenting that she has been teaching in a low-income school as she promised. But in the fourth year, she says, the company that manages the program, FedLoan, said it got her paperwork late. Suddenly, her grants were converted to $22,000 in loans (including interest, which keeps adding up). By the time she is done paying the government back, it will have cost her $30,000. "I remember going out to the mailbox — I even opened it up at the mailbox — and sheer panic just set in," she says. McCollum and her husband had just found out she was pregnant with their first child. Money was already tight. So McCollum, like many teachers, appealed to FedLoan, saying she had met the terms of the TEACH grant. But the company denied her appeal, saying it could not convert her loans back to grants. "It's just such a hopeless conversation because I'm on the phone in between classes pretty much trying to get all of this information together, crying, trying to plead my case," McCollum says. But the answer was always "no, no, no. I would just get shut down time and time again." McCollum sent in documents showing she was meeting the program's teaching requirements. She also sent FedLoan a signed letter from her school principal confirming that they had completed her TEACH grant's annual certification paperwork ahead of the deadline and that McCollum had tried to fax the paperwork from the school office. FedLoan declined to be interviewed for this story but in the past has told NPR that the company is committed to resolving borrower problems. McCollum says she also mailed the certification paperwork ahead of the deadline. And even if it did arrive a couple of days late, she and other teachers in the same situation are horrified to find out that just missing a paperwork deadline should have such a catastrophic result. After two years of fighting, McCollum says she had given up hope. And many teachers who reached out to NPR said the same. But it may not be hopeless after all, especially if the Department of Education acts to fix the problems after its review. But teachers like McCollum will have to be patient. Department officials say the review will take time. And while the review is underway, it's still unclear whether teachers who've been hurt by the program will get their money back. The department says it may be limited in what it can do by the rules Congress wrote for the program. Legal experts outside of the department say they believe it does have the power to fix the program and make things right for teachers. Julie Miceli, who worked as a deputy general counsel at the Education Department until 2014, says fixing problems like this was her job. So we asked her, could the department make this right — could it go back and review whether TEACH grants like McCollum's should have been converted, and, if not, fix it and give some teachers their money back? "I think they can. I don't think there's anything in the statute that relies on complying with a paperwork deadline," Miceli says. This is a key point. Miceli says it seems FedLoan has been strictly enforcing paperwork rules, which the department has the authority and flexibility to revisit. Being so strict about paperwork, where even a minor error can have such a drastic outcome, she says, goes against the spirit of the TEACH grant. "It's not a fine, it's not a fee," Miceli says, like a late payment on a credit card or tax bill. "It's a complete conversion from a grant to a loan. And I don't believe that was the intent where you've got a borrower who's actually meeting the terms of the program." Other legal experts agree. But Miceli stresses that she still has friends and former colleagues in the department and says that they're good people who care about education and that no one there is trying to hurt these teachers. Meanwhile, Sen. Mark Warner, a Virginia Democrat, has introduced bipartisan legislation to reform the TEACH grant and other student loan programs. He too says these teachers should get their grants back if they're meeting the requirements. "We've got a clear societal need to have good, talented teachers teaching in low-income schools," Warner tells NPR. "This is morally the right thing to do; long term economically, it's the right thing to do. It needs to get fixed." At a congressional hearing Tuesday, Rep. Bobby Scott, D-Va., brought up NPR's coverage and asked Education Secretary Betsy DeVos whether legislation was necessary to fix the problems. "I don't believe so," she replied. "We are aware of the issues within that program and have taken steps to address the issues therein," she said. 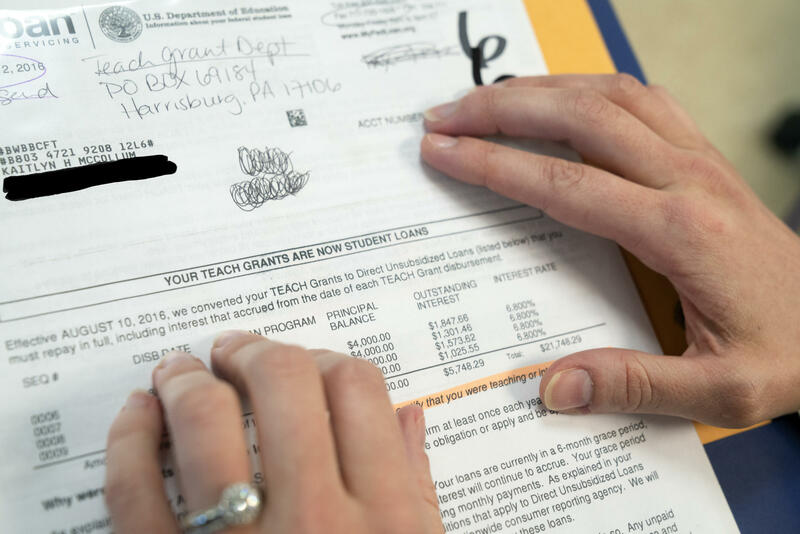 As the Education Department is figuring out what it's going to do next — it says that teachers who believe they've had their grants unfairly converted to loans should appeal first through FedLoan and then, if necessary, through the department's Federal Student Aid Ombudsman Group. McCollum recently did that. And she is now waiting, hoping better news arrives in her mailbox soon. Editor's note: Photos of documents on this page have been altered to obscure Kaitlyn McCollum's private information. We have an update now on teachers who were given grants to work in low-income schools and then - financial calamity. They say their grants were unfairly converted to loans they now have to pay back. After a series of NPR stories revealing this problem and also a government estimate that it's affecting thousands of teachers, the Department of Education now says it has launched a review. NPR's Cory Turner and Chris Arnold report. 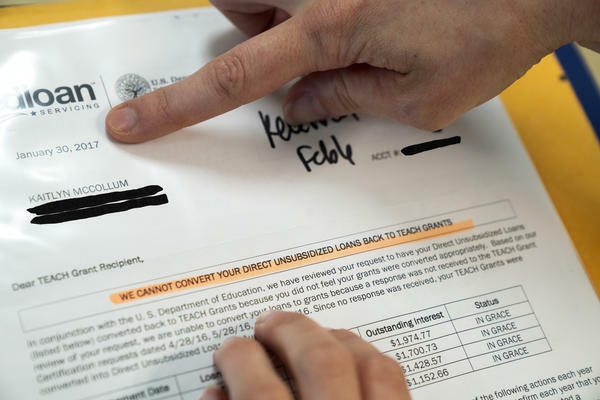 CORY TURNER, BYLINE: The TEACH Grant Program gives teachers money to pay for college or a master's degree in exchange for making a few promises. They agree to teach a high-needs subject, like math, for four years in a school that serves lots of low-income families. That's it. CHRIS ARNOLD, BYLINE: It sounds simple enough, but the program also makes them send in paperwork every year certifying that they're keeping those promises. And often, a little mistake - a missing signature, a date, anything - can lead to their grants - what was free money - getting converted into loans with interest. TURNER: After our stories aired, our inboxes and social media accounts filled with messages from teachers saying, this happened to me, too. KAITLYN MCCOLLUM: It's just - it's ridiculous. It's mind-boggling. It's been two years of torture. TURNER: Kaitlyn McCollum is a high school teacher in Columbia, Tenn. She says every year, she sent that paperwork in on time. But the fourth year, she says the company that manages the program - it's called FedLoan - it told her they got her paperwork late. ARNOLD: She says she sent it in on time. But suddenly, her $16,000 of grants became $22,000 in loans, and the interest keeps adding up. By the time she's done paying the government back, it will have cost her $30,000. MCCOLLUM: I remember going out to the mailbox - and I even opened it up at the mailbox - and sheer panic just set in. 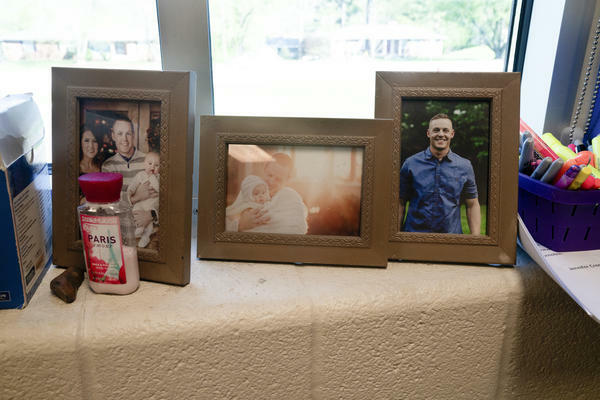 TURNER: McCollum and her husband had just found out she was pregnant with their first child. Money was already tight. ARNOLD: So McCollum, like many teachers, appealed through FedLoan and said, basically, hey are you kidding me? I'm teaching in a low-income school. I'm doing what I said I would do. How can a little paperwork problem mean I owe this outrageous amount of money? TURNER: But FedLoan denied her appeal, saying it could not convert her loans back to grants. MCCOLLUM: It's just such a hopeless conversation because I'm on the phone - in between classes, pretty much - trying to get all of this information together, crying, trying to plead my case. No, no, no. I would just get shut down time and time again. Oh, they won't do that. They're not going to change their mind. Once these loans are loans, they never get changed back. TURNER: The company, FedLoan, has told NPR it is committed to resolving borrower issues. ARNOLD: After two years of fighting, McCollum says she'd given up hope, and many teachers who reached out to us said the same thing. But it turns out it may not be hopeless. We've now learned that the Department of Education has launched a new internal review. The department tells NPR that it is now, quote, "absolutely committed" to improving how it administers the TEACH Grant Program. That includes a new top-to-bottom review of all aspects of it. But teachers like McCollum will have to be patient. Department officials say the review will take time, and it's unclear if teachers will get their money back. The department says it may be limited in what it can do by the rules that Congress wrote for the program. TURNER: So we wanted to know, what can it do legally to make this right? And to answer that question, we found the perfect lawyer to talk to. JULIE MICELI: When I was at the department, an issue like what we're seeing with the TEACH grant is the very kind of issue that would've likely fallen on my desk. ARNOLD: Julie Miceli worked as a deputy general counsel at the Education Department. She was there for five years. So we asked her, could the department make this right? Could it go back and review whether TEACH grants like McCollum's should have been converted, and if not, fix it and give some of these teachers their money back? MICELI: I think they can. I don't think there's anything in the statute that relies on complying with a paperwork deadline. TURNER: And this is a key point. Miceli says what seems to be happening is FedLoan has been strictly enforcing paperwork rules that she says the Education Department has the authority and the flexibility to revisit. MICELI: The consequence is so significant. It's not a fine. It's not a fee that everybody has to deal with. It's a complete conversion from a grant to a loan. And I don't believe that was the intent where you've got a borrower who's actually meeting the terms of the program. ARNOLD: Other legal experts we spoke to also agree with that. TURNER: Miceli also wants to be clear - she still has friends and former colleagues in the department, and says they're good people who care about education and that no one there is trying to hurt these teachers. ARNOLD: Meanwhile, U.S. Senator Mark Warner, a Virginia Democrat, has introduced bipartisan legislation to reform the TEACH grant and other student loan programs going forward. He, too, says these teachers should get their grants back, in part because this is an important program. MARK WARNER: And we've got a clear societal need to have good, talented teachers teaching in low-income schools. This is morally the right thing to do. Long term, economically, it's the right thing to do. It needs to get fixed. ARNOLD: As the Education Department is figuring out what it's going to do next, it says that teachers who believe that they've had their grants unfairly converted to loans should appeal - first through FedLoan, and then if necessary, through the department's federal student aid ombudsman's office. We have a link to that on our website. TURNER: That's something Kaitlyn McCollum recently did, and she is now waiting, hoping better news arrives in her mailbox soon. For NPR News, I'm Corey Turner. ARNOLD: And I'm Chris Arnold. Transcript provided by NPR, Copyright NPR.